welcome to medan, horas !! mejuah-juah ! !, welcome by enjoy holiday medan on arrival at kuala namu international airport medan, first visit is the maria annai church at velangkani a place of worship dedicated to the mother maria, the healer, and this name is taken from the praying dedicated to mother maria which has become the tradition of shoreline people at velangkani. the uniqueness of this church is its original moghul architecture. the trip continues to the cave of maria at pecawir. then group will be taken to the cool highland town of berastagi, a tourism place with its remarkable mountain scenary and refreshing weather, arrive in berastagi, transfer to local restaurant to have lunch, after lunch, city tour berastagi, visiting fruits, flowers & vegetable market, shopping tour, and views two active volcanoes, sinabung and sibayak, check in hotel, free program, enjoy berastagi, dinner will be served in hotel. free program." after breakfast in the morning went to the garden of faith sitinjo dairi, (faith tourism park is located in bukit sitinjo dairi, district sitinjo, dairi, north sumatra province, indonesia. at this location was built a house of worship for all faiths. buddhist temples, churches, monasteries and mosques, set up side by side. this park is about 110 kilometers from medan, north sumatra provincial capital that can be taken about three and a half hours away by car). lunch at local restaurant. next go to prapat through the outskirts of lake toba. stop in sipiso-piso waterfall, rumah bolon ancient and you can enjoy tea and fried bananas bandrek at an altitude of 1200 meters in the area simarjarunjung. toward the evening arrived at prapat-lake toba. dinner at the hotel. after breakfast in the morning, the group set off by boat to samosir. visiting siallagan village with its cultural heritage and village tomok stone trial by stone tombs of king sidabutar. lunch at prapat. finally went to the city of medan and stopped by the patent to buy typical souvenirs from pematangsiantar. arrive at medan in the afternoon. dinner at the hotel. 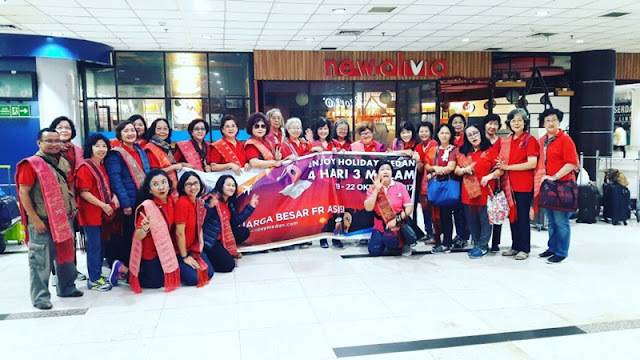 after breakfast at hotel, medan city tour, visiting maimoon palace and then shopping tour to pasar ikan lama, medan mall / sun plaza, transfer to airport kualanamu,tour ends.